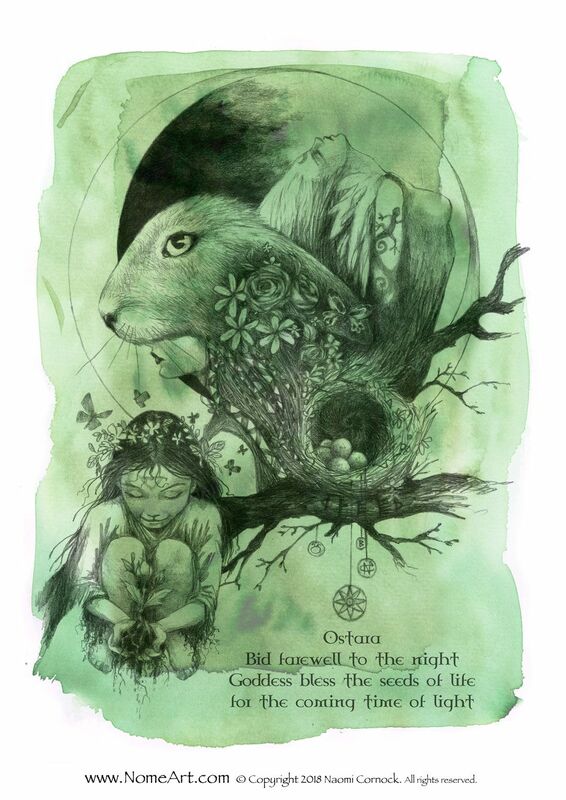 Ostara – Spring Equinox – 21st/22nd of March. It is traditionally the day of equilibrium, neither harsh winter or the merciless summer, and is a time of childish wonder, growth and rejoicing in the return of the light and warmth. 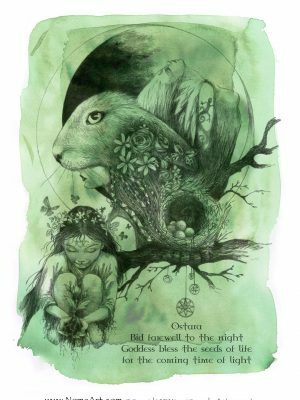 Ostara is the celebration of the beginning of spring proper. March/April is the peak time of year for the appearance of eggs, which were a highly valued source of protein for our winter-starved ancestors. Ostara’s legacy is all those coloured eggs which many of us still hang on trees, or hide for our children to find every year. The deity associated with this festival, in Europe (from the Germanic pantheon) is known as Eostre or Ostara, the maiden goddess of fertility, the dancing white maiden wreathed in flowers. She is the joy and vigour of youth, the awakening earth, warm days of showers and sunshine, the spring dance of the hares, the return of the birds and the appearance of much needed fresh greens. All hail the maiden as she washes away the cold nights of winter and heralds the warm welcoming days of spring.